About 4 weeks ago my husband and i embarked on a new fitness routine. One that involves cutting out refined sugar, starchy carbs, added oils, and wheat. This combined with the exhaustion from the excruciating workouts have left me searching for breakfast alternatives… Tofu scramble and overnight oats are great, but they have there limits. So this week I thought I would experiment with quinoa. This power food has twice the nutrients and protein of oats and is pretty much a blank canvas for you to build upon. This recipe was is simple I almost feel silly posting it. 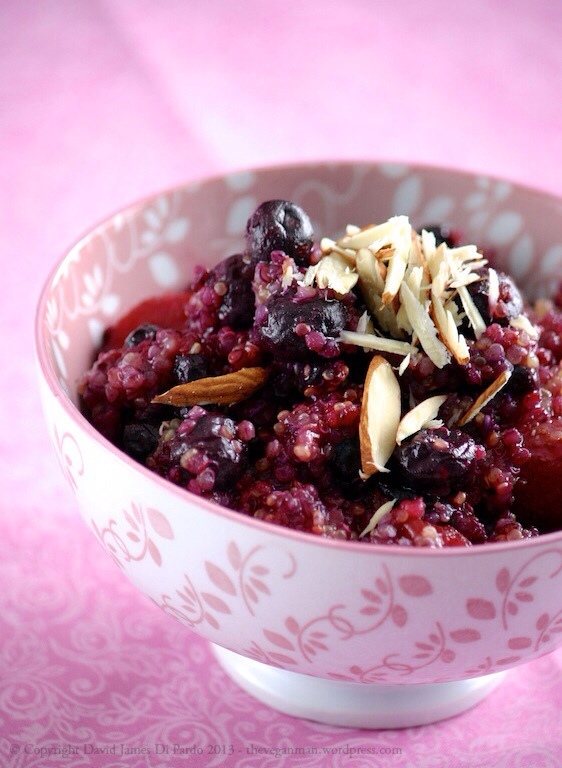 The bright flavor of the berries, the sweetness of dates, and the pop of quinoa were a perfect marriage to help brighten these dull winter mornings… Its delicious both warn and cold, which is great because I can make a pot at night after coming home from the gym, and have it ready in the fridge the next morning for a quick breakfast on the go. In a medium sauce pan over medium heat, combine the quinoa, rice milk, dates, cinnamon, nutmeg, and dried berries. Bring to a boil, reduce heat to medium low and simmer covered until the rice milk has been absorbed. 10-15 minutes. Stir in frozen berried and continue to cook until the berries have thawed completely. Serve warm topped with slivered almonds or chill overnight and serve cold.